Who is your team? A group at the office, your school PTA, your own family? How important are the connections within that team and what can you do to encourage connections? Start with conversations and real interactions with others. Let these moments build with shared experiences and emotions until real connections are formed. Much of life revolves around instant gratification, helicopter parents, pushed and stressed kids, social media pressures and sleep deprivation. 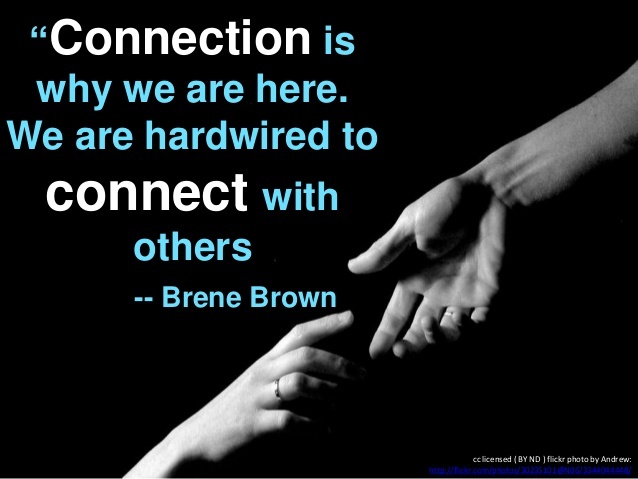 To form a true connection with others takes time. This seems to be a scarce commodity these days. Connection has the added problem of the technology world that we live in. These devices are taking their toll on conversations and communication between people and impacting our ability to relate to others, to show empathy, patience and most importantly, on our mental health. Give the people in your team (work or home) a voice and listen to them. Make them feel valued. Give your team your support and make sure they know they have it. Notice when things don’t feel right and act on it. Get everyone in your team participating in the real world. Take a walk, do something fun – get out and about together. Have ‘no devices’ time and make sure you communicate directly – eye to eye contact and no distractions. Human interaction is key. Show interest in others and follow through. Develop empathy by engaging through conversation, listening and asking questions. If you give this time and focus it will pay off in dividends, as ‘connecting with others’ fulfills our basic human need for love. Older PostWhat's your laughter and inclusive culture at work?